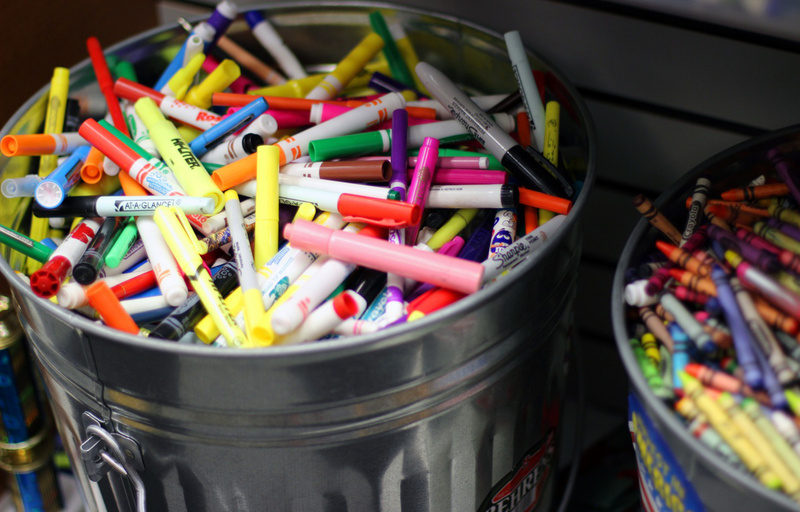 Many of us have heard stories about teachers who are scrambling to find inexpensive school supplies and materials for art projects. At one point in our lives, each of us has likely contributed egg cartons, milk jugs, buttons or other household castaways to a neighborhood school for use in an art class. With tiny supply budgets and limited resources, teachers have spent decades finding and working with recycled materials in their classrooms. The St. Louis Teacher’s Recycle Center is a virtual wonderland for creative minds. Everything is donated by the general public or by local industries, providing 20,000 pounds of materials each year. The Center’s mission is to keep reusable items out of landfills and provide them to children and classrooms that desperately need them. When asked where all of these donations come from, Susan advises, “word of mouth seems to propel a lot of the donated goods, with a lot of people just walking in and dropping things off.” Pointing to several large stacks of multi-colored straw hats, Susan remarked that they had received an entire tractor trailer load of them from a donor. A lifelong educator and mother of three, Susan founded the St. Louis Teachers’ Recycle Center in 1992 while still working as a full time teacher. 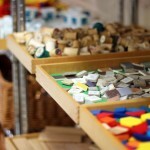 Years earlier she traveled to Italy to study the Reggio Emilia Approach, a philosophy of early childhood education that leans heavily on the arts, and is paired with plenty of structured and unstructured play time. Children are allowed to explore, experiment and express their feelings through play and are active participants in the direction of their learning process. The vast amount of donated inventory crammed into the small store front is overwhelming. There are garbage cans filled with wine corks and magic markers, large bins of buttons, shelves of trophies, shoe boxes, scrap fabric, empty jugs, wood blocks of various shapes and sizes, and an incredible amount of paraphernalia from the medical supply industry. Many other items are indescribable and are a complete mystery, but provocative in every case. Susan started the first Recycle Center in her garage, and then moved it to a Junior Achievement Building in her neighborhood where she was allowed to distribute materials for three months out of the year; June thru August. “It was a cinder block building with a tar roof, no windows and no air conditioning. I filled it in a month and I invited all of my teacher friends. It was my test market,” she confided. 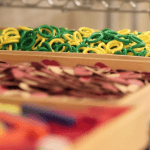 For the next few years Susan moved the materials back into and out of storage for the summer months, until Dr. Sanford of Lindbergh School District invited her to take up residence in one of their schools. The Recycle Center continued to grow and moved another 17 times over the years, finally settling at their current stores in Chesterfield Mall and on Lemay Ferry in South County. The store is open to the general public, and everything is FREE, with a small service fee of $1 per pound. For those who like to buy in bulk, Pound Passes in larger amounts can yield more poundage, for instance a $90 pass will gain you 125 pounds of materials. The smallest Pound Pass is $10 for 10 pounds. A list of accepted items for donation can be found here. Donations are only accepted during normal store hours. Since the stores are manned by volunteers, they are not open every day of the week. Visitors should consult store hours on the Center’s website at www.sltrc.com. Article written by VALERIE TICHACEK on St. Louis County Arts.